Creating professional online courses and sell them on specific platforms give you the chance to earn hundreds of thousands of dollar. If you are already an online course provider, you’ll know how crucial to use appropriate tools for developing online courses, right? That’s why we’ve put together this comprehensive list of 5 best tools to create professional online courses. It can be an interactive lesson you publish on a specific learning management platform (or LMS) such as Udemy, Coursera or Lynda which lets you earn money from learner’s subscription too. Creating this kind of course, you will have more control on your courses such as tracking your learner’s retention, developing different scenarios modules to target a certain type of learner. That’s what we call professional online courses. Such kind of course has to be created in HTML5 output, within a certain amount of time. This is an example of a HTML5 online course on Lynda. Mentorship is an online course on Lynda.com. Click on the image to be redirected to Lynda.com to watch it! Thanks to our careful review of more than 20 free and paid tools on the market. Here is a comprehensive list of 5 best tools to create professional online courses (in HTML5) for Windows/ Mac. Whether you are a professional online course providers, a content creators or just a teacher who want to share your experience with other, these tools are the best options to get started. ActivePresenter is one of the most powerful tools to create professional online courses whether it is a video tutorial on YouTube or an interactive HTML5 e-learning course. It’s a fully-featured, all-in-one program which is capable of creating how-to and training videos or a complete fully responsive e-learning courses from A-> Z. Everything you need is included in a solid lifetime package. For more detail about ActivePresenter, I suggest you spend some minutes reading this detail review. Record screen and edit video without watermark or time limit in free version. Intuitive user interface and smart workflow for content authoring. Export video into MP4, AVI, MKV (popular video formats on YouTube). Responsive layout design, various kind of interactions and quizzes. There is a free version without any limitation for non-commercial purposes. Standard license is $199/ lifetime. Professional License is $399/ lifetime. Articulate is one of the biggest name in elearning industry at present time. Actually, Articulate Storyline 3 is not the only product of Articulate you can use to create professional online courses. As far as I know, Articulate 360 is also capable of developing elearning courses from A to Z. However, it comes with so many extra features (and more money too) that we don’t really need. That’s why I suggest you use Storyline 3 for making professional online courses. Firstly, Storyline 3 license price is for lifetime ($1398). It is more affordable than $1299 annually license price of Articulate 360. Added to that, it has everything you need to create perfect online courses in HTML5 like ActivePresenter plus typical course templates and character library. Here is our detail review of Storyline 3! Simple to use tool with intuitive user interface. Has various kind of interactions and quizzes, reporting and tracking options. $1398 per license/ lifetime. There is no free version! Adobe Captivate is smart authoring platform that does the heavy lifting of creating responsive elearning content. It can help you reduce your authoring time with their unique features. Like ActivePresenter and Storyline 3, Adobe Captivate has everything you need to make perfect online courses rapidly. If you have some prior content authoring experience, you’ll be able to use Adobe Captivate after few hours. Take a look at this review about Adobe Captivate. The only thing I don’t like about Adobe Captivate is that its license price is way too expensive compare to similar applications on the market. What if you don’t want to create a HTML5 online course, but a tool to create online training videos or how-to tutorial series to upload on YouTube or share to your company platform? That’s when you need Camtasia 2018, an industry standard and powerful program for producing online training videos on Windows and Mac. Camtasia is known as an all-in-one program with a full HD screen recorder and a classic timeline video editor. Using Camtasia to create online courses in video formats is as easy as a piece of cake. Read this review to learn more about Camtasia! Simple to use and powerful video editor with many special effects and annotation tools. 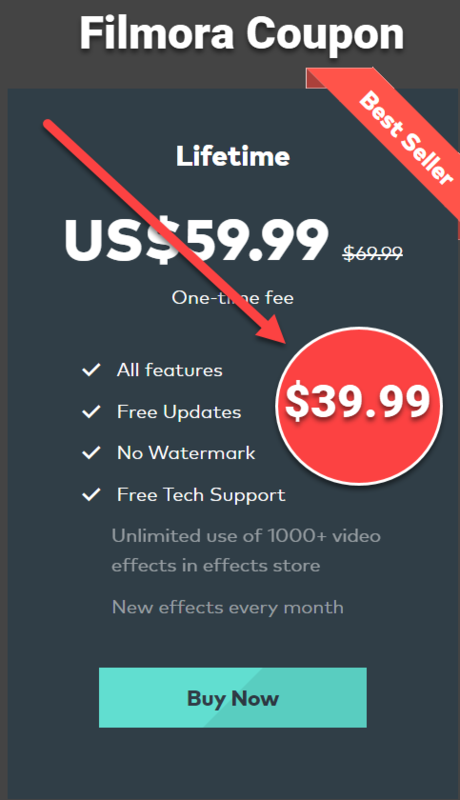 Edit video in 60 fps with a flexible media library, themes and free assets (video and audio). No free version. Trial in 30 days! Another tool for making professional online courses in video formats is Filmora video editor. Like Camtasia, Filmora video editor has everything you need to polish your recorded screencast plus dozen of ready-to-use annotation templates and effects to transform you boring tutorials into engaging videos. That’s not to mention Filmora Video Editor has a free version to try without any limitation (with a watermark on the output). Read this review before you download it. Has built-in screen recorder, filters and effect packages. Easy to learn for novices. Export video into various formats. Free version for Windows and Mac with watermark on the output. When it comes to making professional online courses, you’ll have the opportunity to choose a powerful tool that has everything you need in one package. Choosing what program depending on the type of content you want to create. If you have any question about these programs, don’t hesitate to contact us any time. Don’t forget to follow us to receive more valuable post notifications in the future!